Book - "Artistes" for the Lord! 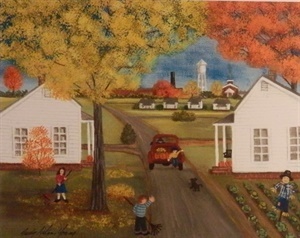 I feel truly blessed to have grown up on a cotton mill village in the 1950's & 60's when the textile industry was at its peak. Thanks to our hardworking elders who worked in the textile mills, my generation was able to have a better life. Sadly most of those elders and textile mills have passed on. 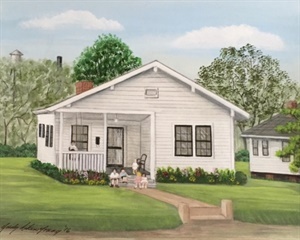 In the 1990's, I was inspired to use my art as a tribute and to illustrate the stories of the cotton mill people and their neighborhoods. 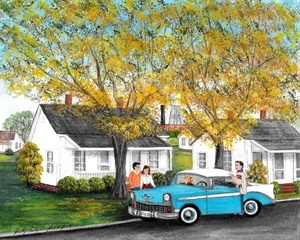 The neighborhoods may have been in different cities and states, but the stories are similar. 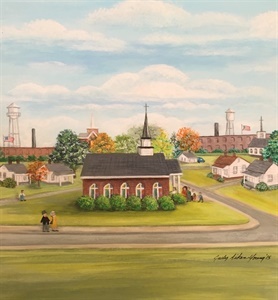 The landscapes of the cotton mill villages were dotted with Smokestacks, Water Tanks and Steeples. Therefore, I chose this as the title of this portfolio of paintings and the title of my newest book. The inspiration I had way back when still burns deeply within me this day! 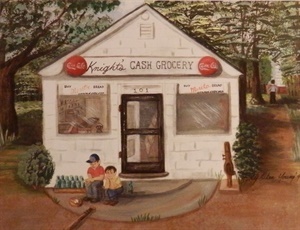 Children sharing their change to buy one soda at the mill village store! 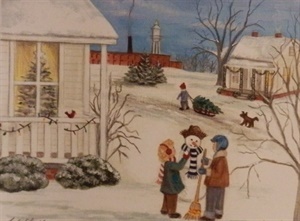 Children playing in the snow on the mill village. The wheels on a cog wheel wagon were made from the gears on the looms in the cotton mill. 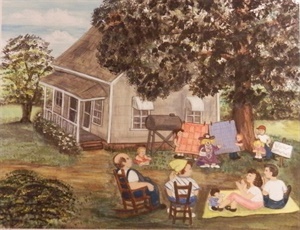 This is a mill village family making memories on a Sunday afternoon. 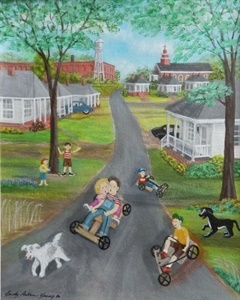 The actual photo used for inspiration is the Padgett family from the Park Place Community, Greenville, SC. The nearby cotton mills were Poe Mill and American Spinning. 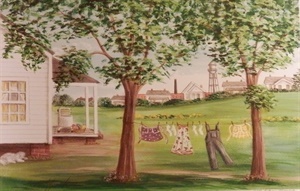 The clothes drying on the line are items often worn by the textile workers. 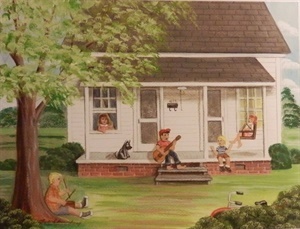 Children singing on the porch of a mill house. 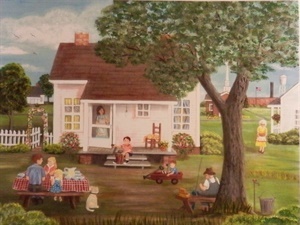 Churning ice cream on the back porch on a hot summer day and waiting on the neighbors to arrive. 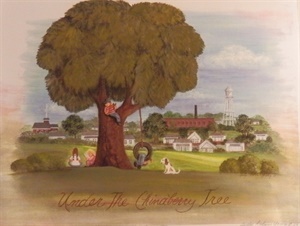 Children playing under the china berry tree. A tree indigenous in the southeastern US. They were plentiful on the mill villages. Nighttime summertime fun on the mill village. friends and cruising the local burger joints! Read more about this amazing Christian woman and her family in Wilt Browning's book "Come Quitting Time". Back alleys were service roads between the streets on the village. The perfect place for kite flying, bike riding etc. 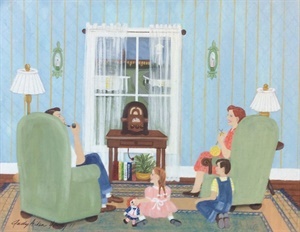 Artwork used on poster of the 9th Annual Greenville Textile Heritage Festival titled "Fabric Of Our Faith, Woven At The Mill Hill Church"
A 1940's family is gathered "Around the Radio". 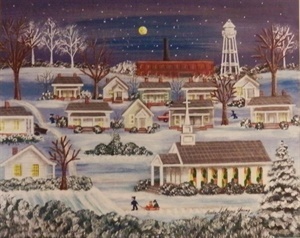 The mill and village at night is featured in the windows. 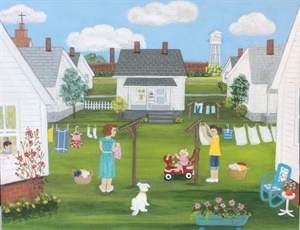 Neighbors are chatting as they hang out their laundry in this retro scene of the mill village. 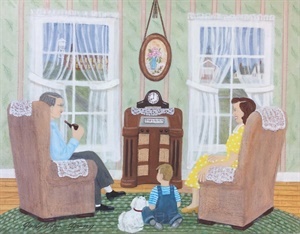 A family is gathered around the radio on a Saturday night listening to the Grand Ole Opry. 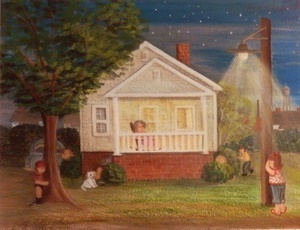 A nighttime scene of the mill is featured in the window. 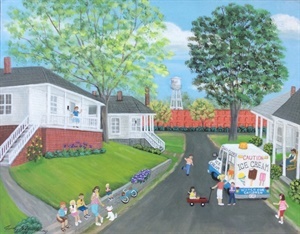 A cold sweet treat on a hot summer day when the ice cream truck visits the mill village! a mill house in the 1950's discussing the recent election. 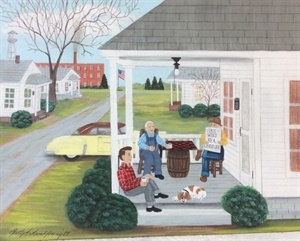 "Snapping Beans & Singing Praises"
We loved to visit Grandma who lived on the mill village. We would help her snap beans while we sat in the swing and sang along with the radio! Children riding "cogwheel" wagons made with the gears from the textile machinery in the cotton mills. 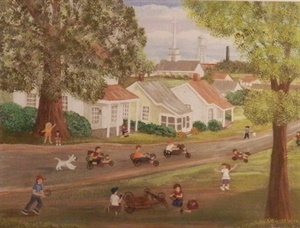 Content copyright by Judy Aiken Young.